Krupps K1100E 500mm Pass Through DIshwasherWith over 50 years’ experience Krupps name has been associated with high-quality, excellent performances and reliability.For more information about this product please refer to the technical documentation K1100E Specs TYPE Pass Through Dishwasher LINE Koral Line BASKET 500x500 The KORAL line is distinguished by its wide range of models suitable for any requirements. ü Through the electronic card, the control system provides great customisation options based on your needs, allowing you to accurately adjust any parameter and ensure optimum washing results. ü The tempered glass UNIKO-MID lcd-touch display is extremely reliable and ensures optimum performance. ü Selecting one of the 4 wash cycles available is really simple and practical messages on the display will allow preserving the dishwasher life.ü The K1100E hood type dishwasher is the most suitable solution for businesses that are faced with the washing of different types of dishes, proving capable of washing glasses, dishes, medium sized objects and GN 1/1 baking trays in only 620 mm wide, ensuring a maximum productivity of 60 baskets/hour (1080 dishes/hour). ü The hood type models are fitted with an easily removable basket support for easy cleaning and a rounded moulded tank with integral filters for perfect draining and absolute hygiene. ü The “PUSH TO START” cycle start system ensures less waste preventing the start of empty washes.ü The electronic control allows you to manage various parameters to give you an absolute customisation level and the continuous self-diagnosis allows you to minimise machine downtime, suggesting some operations to be verified. ü The self-cleaning cycle at the end of the day cleans the wash tank and empties the boiler from the hot water, preventing limestone forming inside. ü The standard double peristaltic electric rinse-aid and detergent dispenser ensures the best result from each wash cycle with great savings thanks to the precise dosage managed by the electronic card; whereas, the moulded washing and rinsing arms ensure great reliability and durability. ü The Thermo-stop function checks that washing and rinsing begin only when the desired temperature is reached. ü The bodywork is made entirely of AISI 304 steel and has been designed with all components in the front to allow easy technical assistance. ..
Krupps K1200E 500mm Pass Through DIshwasherWith over 50 years’ experience Krupps name has been associated with high-quality, excellent performances and reliability.For more information about this product please refer to the technical documentation K1200E Specs TYPE Pass Through Dishwasher LINE Koral Line BASKET 500x500 The KORAL line is distinguished by its wide range of models suitable for any requirements. ü Through the electronic card, the control system provides great customisation options based on your needs, allowing you to accurately adjust any parameter and ensure optimum washing results. ü The tempered glass UNIKO-MID lcd-touch display is extremely reliable and ensures optimum performance. ü Selecting one of the 4 wash cycles available is really simple and practical messages on the display will allow preserving the dishwasher life. ü The K1200E hood type dishwasher with Ø30mm washing arms and boosted wash pump, is aimed at all activities having to deal with rather stubborn dirt residues. Thanks to its dimensions, it is suitable for efficiently washing 18 dishes per cycle with a maximum productivity of 60 baskets/hour (1080 dishes/hour), medium sized objects and GN 1/1 baking trays, as utensils measuring up to 500x500x390(h)mm can be placed in its basket. ü The hood type models are fitted with an easily removable basket support for easy cleaning and a rounded moulded tank with integral filters for perfect draining and absolute hygiene. ü The “PUSH TO START” cycle start system ensures less waste preventing the start of empty washes. ü The electronic control allows you to manage various parameters to give you an absolute customisation level and the continuous self-diagnosis allows you to minimise machine downtime, suggesting some operations to be verified. ü The self-cleaning cycle at the end of the day cleans the wash tank and empties the boiler from the hot water, preventing limestone forming inside. ü The standard double peristaltic electric rinse-aid and detergent dispenser ensures the best result from each wash cycle with great savings thanks to the precise dosage managed by the electronic card; whereas, the moulded washing and rinsing arms ensure great reliability and durability. ü The Thermo-stop function checks that washing and rinsing begin only when the desired temperature is reached. ü The bodywork is made entirely of AISI 304 steel and has been designed with all components in the front to allow easy technical assistance. ..
Krupps K1500E 600mm Pass Through DIshwasherWith over 50 years’ experience Krupps name has been associated with high-quality, excellent performances and reliability.For more information about this product please refer to the technical documentation K1500E Specs TYPE Pass Through Dishwasher LINE Koral Line BASKET 500x600 The KORAL line is distinguished by its wide range of models suitable for any requirements. 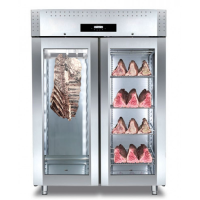 ü Through the electronic card, the control system provides great customisation options based on your needs, allowing you to accurately adjust any parameter and ensure optimum washing results.ü The tempered glass UNIKO-MID lcd-touch display is extremely reliable and ensures optimum performance. ü Selecting one of the 4 wash cycles available is really simple and practical messages on the display will allow preserving the dishwasher life.ü The K1500E hood type dishwasher can wash up to 22 pizza dishes in a very tight space: only 720 mm wide and with the same depth of traditional inlet/outlet stainless steel tables, with a maximum productivity of 60 baskets/hour (1320 dishes/hour). Thanks to the powerful wash pump and washing arms, it is suitable for dishes, objects measuring 500x600x410(h)mm, bread baskets, GN 1/1 baking trays and 600x400(h)mm dough trays. ü The hood type models are also fitted with an easily removable basket support for easy cleaning and a rounded moulded tank with integral filters for perfect draining and absolute hygiene. ü The “PUSH TO START” cycle start system ensures less waste, preventing the start of empty washes.ü The electronic control allows you to manage various parameters to give you an absolute customisation level and the continuous self-diagnosis allows you to minimise machine downtime, suggesting some operations to be verified. ü The self-cleaning cycle at the end of the day cleans the wash tank and empties the boiler from the hot water, preventing limestone forming inside. ü The standard double peristaltic electric rinse-aid and detergent dispenser ensures the best result from each wash cycle with great savings thanks to the precise dosage managed by the electronic card; whereas, the moulded washing and rinsing arms ensure great reliability and durability. ü The Thermo-stop function checks that washing and rinsing begin only when the desired temperature is reached. ü The bodywork is made entirely of AISI 304 steel and has been designed with all components in the front to allow easy technical assistance. ..
Krupps K1600E 600x670mm Pass Through DIshwasherWith over 50 years’ experience Krupps name has been associated with high-quality, excellent performances and reliability.For more information about this product please refer to the technical documentation K1600E Specs TYPE Pass Through Dishwasher LINE Koral Line BASKET 600x670 The KORAL line is distinguished by its wide range of models suitable for any requirements. ü Through the electronic card, the control system provides great customisation options based on your needs, allowing you to accurately adjust any parameter and ensure optimum washing results. ü The tempered glass UNIKO-MID lcd-touch display is extremely reliable and ensures optimum performance. ü Selecting one of the 4 wash cycles available is really simple and practical messages on the display will allow preserving the dishwasher life. ü The K1600E hood type dishwasher can wash up to 22 pizza dishes in a very tight space: only 720 mm wide and with the same depth of traditional inlet/outlet stainless steel tables, with a maximum productivity of 60 baskets/hour (1560 dishes/hour). Thanks to the powerful wash pump and washing arms, it is suitable for dishes, objects measuring 575x645x410(h)mm, bread baskets, GN 1/1 baking trays and 600x400(h)mm dough trays. ü The hood type models are also fitted with an easily removable basket support for easy cleaning and a rounded moulded tank with integral filters for perfect draining and absolute hygiene. ü The “PUSH TO START” cycle start system ensures less waste, preventing the start of empty washes. ü The electronic control allows you to manage various parameters to give you an absolute customisation level and the continuous self-diagnosis allows you to minimise machine downtime, suggesting some operations to be verified. ü The self-cleaning cycle at the end of the day cleans the wash tank and empties the boiler from the hot water, preventing limestone forming inside. ü The standard double peristaltic electric rinse-aid and detergent dispenser ensures the best result from each wash cycle with great savings thanks to the precise dosage managed by the electronic card; whereas, the moulded washing and rinsing arms ensure great reliability and durability. ü The Thermo-stop function checks that washing and rinsing begin only when the desired temperature is reached. ü The bodywork is made entirely of AISI 304 steel and has been designed with all components in the front to allow easy technical assistance. ..